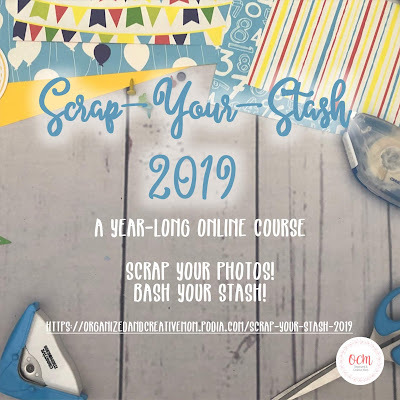 All About the Scrap-Your-Stash 2019 Online Course! I received an email the other day from a wonderful lady who follows the blog, but isn't on Facebook or any other Social Media. By chance she noticed the picture advertising the Scrap-Your-Stash 2019 Online Course at the bottom of my recent January 1-2-3 Layout post. She wondered if she had missed a blog post with all the details, and when she couldn't find any, she contacted me to ask about it. Well, I have to apologize to Gail and any other ladies who didn't know about the course because I didn't specifically post information about it here on the blog! Sometimes I worry that I'm getting in people's faces by sharing too much, but I forget that this blog is one of the primary places that I SHOULD be sharing all the info! I've learned my lesson ladies, and I will endeavour to make sure that the blog is up to date, especially when it comes to new products, course or events that you should know about! So now, please let me tell you a bit about the course! If you just want the lowdown on the course...here you go! The course will run for the entire year of 2019, and each month's lesson will be posted on the first of the month. You DO NOT NEED any specific supplies to take this course. The whole idea behind this course is to inspire you to get your photos into albums, and to use up your stash of materials doing it! Each lesson will feature a one-page sketch and a two-page sketch with cutting guide, instructions, tips and journaling/title/photo prompts. These items will be available for you to download to your computer and/or print as a handout that you can refer to. Each lesson will also have some other components that will vary each month; we'll have a theme, a focus, a stash-buster and a technique. There also may be videos, cut-files or other printables. Registration for the course will not close until December 31st 2019, and it is definitely NOT too late to join us! Currently we have just over 150 ladies enrolled and we are having a great time posting layouts and ideas for using up our stash! If you are ready to join us, or want to check out the course a little bit more, head over to the course page by clicking here. There you'll be able to register for the course and get instant access to the Welcome Info and January Lesson. If you're not too sure whether the course is for you, you can go to the OCM Shop and purchase the Scrap Your Stash 2019 January Printable (which include the sketches, cutting guide, instructions, journal/title/photo prompts and bonus printable journal boxes featured in the January lesson) for only $2.00. I really think you'll like it! So much so that if after purchasing the January lesson for $2.00 you decide you want to join the course, contact me and I'll email you a coupon code to take that $2.00 off the price of your course so that you're still paying only $24.00 for all the materials that are included! Win win! I hope you'll consider joining us for the 11.5 months left in 2019!